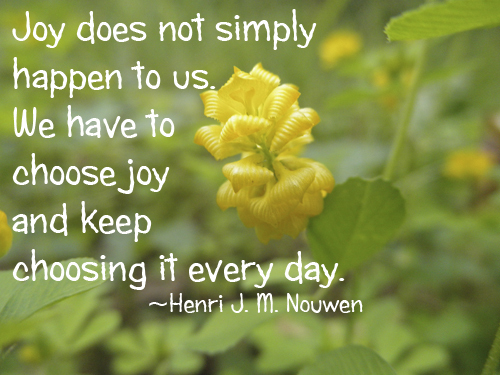 Faith on Friday: JOY, Radiant Joy! Do you know someone who radiates joy? Someone who is always kind? When I think about these traits, I realize that the people I know who are like this are people I want to be around. One such person lives in my neighborhood. I met her a couple of years ago at a “ladies’ coffee” at her home, and she always has a big smile and a joyful spirit. Whenever I run into her (we go to the same hairdresser, as it turns out) it’s the same sweet spirit that draws me. After my car wreck she sent cards and called several times to see if I needed anything. This morning I read the following quote with my morning prayers. 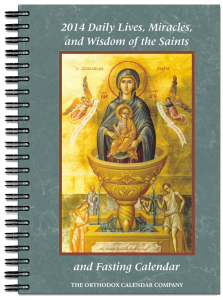 It’s from the 2014 Daily Lives, Miracles, and Wisdom of the Saints, from the Orthodox Calendar Company. Each day it lists the saints commemorated that day and tells a little bit about one of the saints, or if it’s a feast day, it might describe the feast. I’m not going to comment on the quote, except to say that it’s from one of my favorite spiritual fathers, Saint Theophan the Recluse. Theophan was canonized by the Russian Orthodox Church in 1988. I mentioned one of his books in my post on Wednesday—The Spiritual Life and How To Be Attuned To It—which was life-changing to me when I first read it. May God help me to kindle joy in my own heart and in the hearts of others. You cannot be too gentle, too kind. Shun even to appear harsh in your treatment of each other. Joy, radiant joy, streams from the face of one who gives and kindles joy in the heart of one who receives. All condemnation is from the devil. Never condemn each other, not even those whom you catch committing an evil deed. We condemn others only because we shun knowing ourselves. When we gaze at our own failings, we see such a morass of filth that nothing in another can equal it. That is why we turn away, and make much of the faults of others. Keep away from the spilling of speech. Instead of condemning others, strive to reach inner peace. Keep silent, refrain from judgement. This will raise you above the deadly arrows of slander, insult, outrage, and will shield your glowing hearts against the evil that creeps around.